Red 5 Studios wasn't impressed by former CEO Mark Kern's behavior, referring to him as "a force of nature we reacted to". The Escapist has covered a lot of stories about videogame industry layoffs over the years, and in many cases, they have nothing to do with the quality of an individual's work. Still, that's certainly not the case for every layoff. Take the very recent dismissal of Red 5 Studios CEO Mark Kern, which offered little more than a leaked internal email for readers to find meaning in. According to a new source from Red 5 Studios, however, Kern wasn't someone the team enjoyed working with. Prone to extended absences and impulsive decisions, Kern's leadership slowed progress on Firefall and may have even impacted the company's reputation overall. "I don't think [Kern's departure] will impact anything," a source within Red 5 told The Escapist. "[Kern was] more a force of nature we reacted to than a part of the team." The source added that Kern hasn't been to Red 5's offices in weeks, and when he does visit, he did nothing but "randomly make decisions that nobody [could] counter." While the above statement was from a single Red 5 source, it does appear to reflect the larger organization. Online reviews of Red 5 Studios gave the developer a low rating overall, with only 20% of employees recommending the company to friends. "Horizontal Structure does not allow for decision making," one employee writes. "Getting things done is nearly impossible, as vision holders are not active in decision making process until after decisions are made." It's not clear whether a lack of satisfaction among employees can be laid fully on Kern's leadership, but the dismissal will shake up Red 5's management regardless. 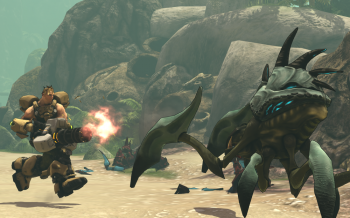 Whether the new CEO can improve the developer's prospects and its Firefall MMO remains to be seen. UPDATE: Another Red 5 Studios employee has contacted The Escapist, echoing the statements from previous communications. "Mark was incredibly smart and had big ideas," the source said, "but his leadership style was erratic, impulsive, and very disuptive - basically the worst thing for a flat organization. I think his departure will allow Red 5 to plan and execute much more efficiently."